Last month we organized a forum at the University of Guam on nuclear dangers to Guam, both from the nuclear weapons of others, but also accidents involving the nuclear weapons kept on Guam by the US military or the nuclear-powered vehicles that are docked here. It was somewhat disappointing when in a room meant for close to 200 people at the UOG CLASS Lecture Hall, we only had about 40 people in attendance. As one of the speakers on the panel remarked, this is a critical issue, which few people seem to care about. That is one reason why it is so critical. It looms around us, as threats from others or dangers from within, but we don't seem to take it very seriously at all. Robert Underwood once said that living in a colony and not taking decolonization or colonialism seriously is like running a hospital without taking seriously issues of illness and treatment. I would argue a similar thing on Guam in terms of the dangers our heavily militarized existence presents. Ti hu tungo' sa' håfa, lao gi halacha na tiempo, sigi ha' hu egga' este na video/ya hu ekungok este na kånta. Gof na'chalek i kanta, lao guaha tinahdong na hinasso lokkue', achokka' parody ha' na kånta. Buente, gof malago' yu' na bei egga' i "prequel" na mubi siha ta'lo ginen Geran Estreyas. Judge Frances Tydingco-Gatewood recently ruled in favor of Dave Davis in his lawsuit alleging that his constitutional right to vote is being violated by him not being able to register for Guam's decolonization plebiscite. The past few weeks have been difficult with plenty of debate and discussion about what to do next and how something like this could have happened. How a country supposed based on ideas of freedom and liberty could care so little about such ideas when it comes to the very people it has colonized for more than a century? 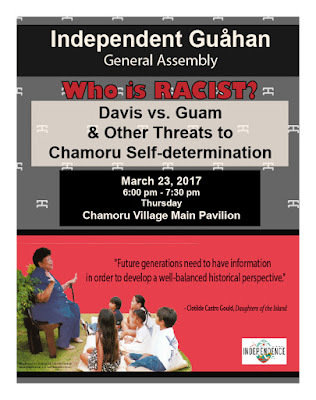 For Immediate Release, March 20, 2017 – Independent Guåhan invites the public to its monthly General Assembly (GA) on Thursday, March 23rd from 6 – 7:30 p.m. at the Main Pavilion of the Chamorro Village in Hagåtña. 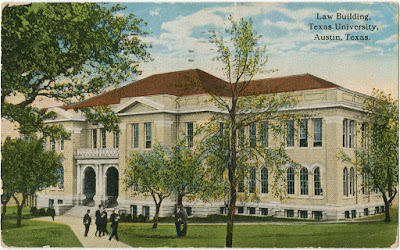 This month’s educational presentations will focus on the need to respect the Chamorro people in their quest to self-determination in light of current actions on behalf of the US Federal Government deeming the decolonization plebiscite and Chamorro Land Trust, “race-based discrimination”. In honor of Mes Chamoru, the meeting will be bilingual in both English and Chamorro. 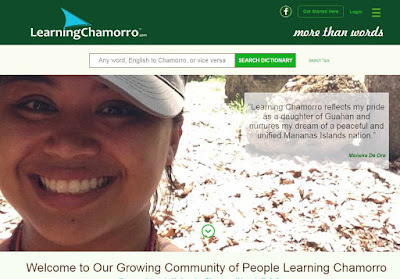 For several years I have been assisting Siñora Rosa Palomo and Professor Gerhard Schwab who are my colleagues at the University of Guam with the development of an amazing, new, free language learning website built around the learning of the Chamorro language. Humuyongña i na'ån-ña "Learning Chamorro." After years of tirelessly working on building the site, it was launched last week. A Pacific Daily News article about it, was picked up by USA Today and shared several thousand times on social media. The website would not be possible without the love labor of GuamWebz and Rhaj Sharma. Some media on the launch can be found below. Sen magof hu na put fin in baba este na website. I have heard in the media, and seen on-line that some on Guam (and elsewhere) are referring to Dave Davis as a hero. Eiii na kinalakas. 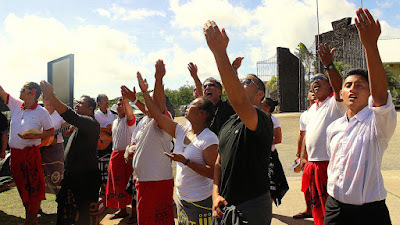 Davis recently won a case in US Federal court striking down the Guam decolonization law as being "unconstitutional" or potentially opening up this sacred, albeit symbolic vote to any resident of Guam. When I saw/heard this, it scared me in so many ways, perhaps even more so than the actual losing of this round of his case. I wrote my column in the Pacific Daily News this week about the friends that Dave Davis currently keeps, who have bought into his racist rhetoric and weaponized it, targeting the Chamorro people of Guam and their aspirations for decolonization. Mensahi Ginen i Gehilo' #22: Biba UOG Press!